Montreal in the 1960s had a thriving, open folk music scene. I remember at the age of fourteen coming home after school to my parents’ house in suburban western St. Laurent, finishing my school work and then going out again at seven o’clock on dark, bone-chilling winter nights, to make the hour-long trek by city bus all the way downtown. My destination was a folk club called The Fifth Dimension, on the second floor of an old factory building on Bleury Street just north of St. Catherine. In 1963 the place was taken over by Gary Eisenkraft, a high school dropout and folkie, and renamed The Fifth Amendment. Eisenkraft, only three years older than me, had spent some time in New York and learned enough about the folk scene to feel confident that he could run his own establishment. The space, as I recall it, was tiny and could seat at most forty to fifty people packed in around café tables. There was a small area at the front for a stage. If you went on a weeknight, as I frequently did, there might be as few as a half-dozen people in the house and you could take a seat just six feet away from the performers and, best of all, study their guitar technique. Some of the folk artists I remember seeing up close at the club included John Hammond Jr., Tom Rush, Eric Andersen, Brownie Terry & Sonny McGee, and Reverend Gary Davis. Eisenkraft, who with his thin physique, long hair, and granny glasses looked a bit like John Lennon, took notice of me after a while. He sold me my first steel-stringed guitar, an old Martin 00-18 that had a great tone but was rather beat up and hard to play. As part of the deal he invited me over to his place and gave me my first lessons in Travis picking, an essential folk music guitar style. Eisenkraft went on to run two other small clubs in succession, The Penelope and then The New Penelope on Sherbrooke Street, which was larger and featured more established acts. 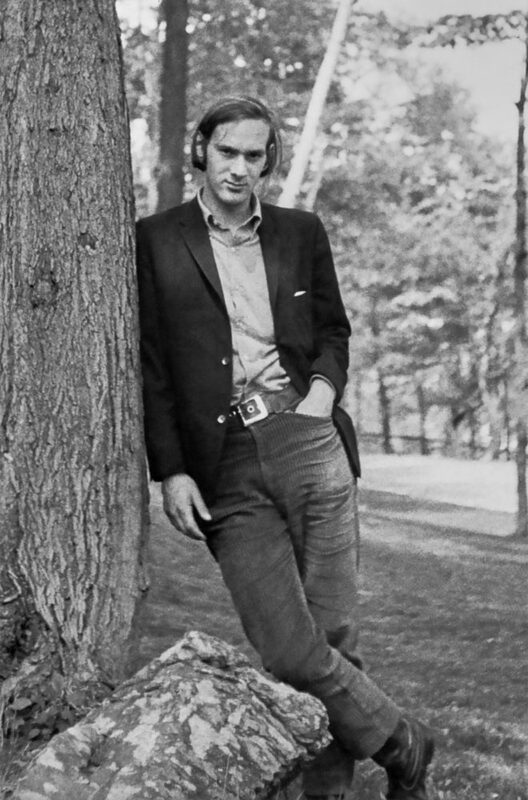 I recall seeing Phil Ochs there, probably in 1966, singing his song “Flower Lady” for the first time. There were two other places that were very important to me and other young musicians just starting out, The Montreal Folk Workshop, at Moose Hall on Park Avenue near Sherbrooke, and, later on, The Yellow Door Coffeehouse, in a basement on Aylmer Street. The Folk Workshop took place one night a week and attracted a large crowd not only because of the quality and variety of the performers but also because Moose Hall had a licensed bar. Each evening included both an open mike component and sets by the featured act, and it was on that stage that I sharpened my skills as a solo performer. The Folk Workshop was a vital incubator of folk acts in Montreal, most notably the Mountain City Four, consisting of the young McGarrigle sisters, Kate and Anna, Peter Weldon and Jack Nissenson, and often joined by their friend and collaborator Chaim Tannenbaum. 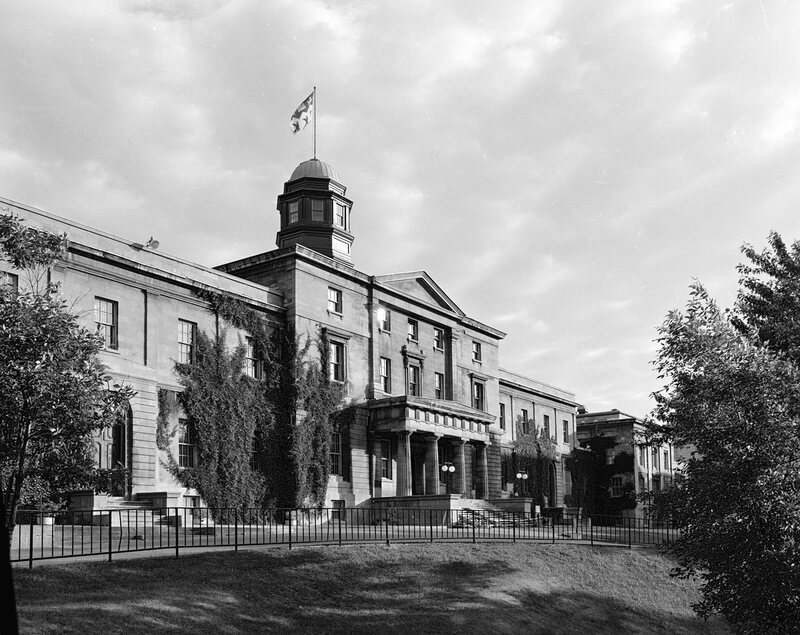 I entered McGill University in September 1965 and continued to develop my skills as a performer. During my second year of university I began to spend many hours writing poetry and, for the first time, my own songs. I continued to frequent Moose Hall and also began to attend open mike nights at The Yellow Door, just a few blocks off the McGill campus. I also participated in McGill’s small but very active Folk Music Society where, in an intimate setting, you could listen to and interact with great musicians, such as Bill Monroe and his Bluegrass Boys, who were brought to Montreal by the student group. I first heard Leonard Cohen’s songs performed in Montreal by a group from Toronto named The Stormy Clovers, the first group to play his songs in public. In June 1966 they sang at a coffeehouse on Sherbrooke Street and performed “The Stranger Song” and “Suzanne.” This was almost half a year before the first recording of “Suzanne,” by Judy Collins, was released. In the fall of 1966 I was one of the editors of a cultural magazine at McGill called Echo, put out by Jewish students on campus. 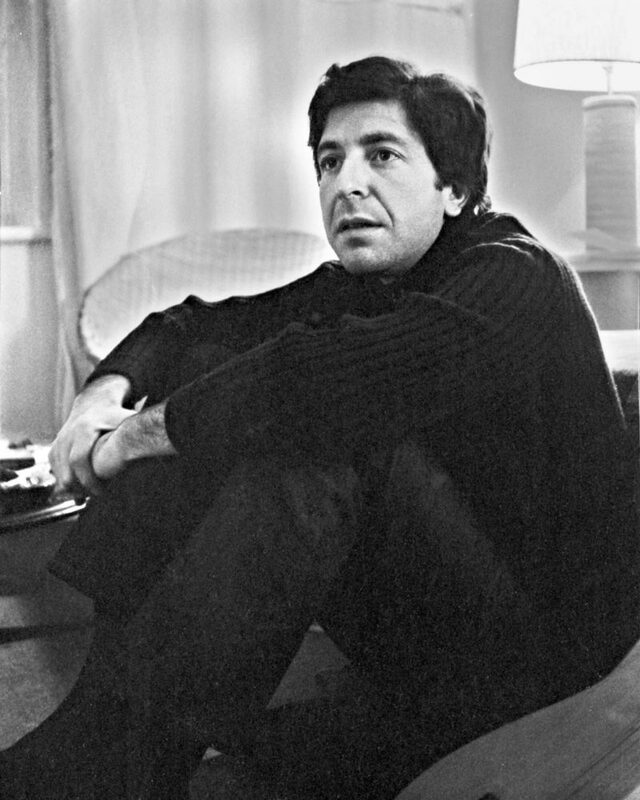 For our annual literary issue we decided to ask Leonard Cohen for an interview, to which he readily agreed. One evening in November Harvey Mayne, Gaby Goliger, and I went up to his flat on Aylmer Street. It was the very same day that Cohen had received his copy of the Judy Collins album In My Life, and when we entered we heard her rendition of “Suzanne” playing in the background. Though he was already a prominent literary celebrity, a published poet and novelist with six books to his name, Cohen was warm, hospitable, and generous with his time. He talked about poetry and religion and music and discussed his ambition to embrace folk music as a career, a move that was still tentative in his mind. He showed us a photo of himself in The Buckskin Boys, a high school musical group he had formed, as if to say this was his original and truest ambition. I had a lot of chutzpah and after Cohen sang a number of songs for us I borrowed his guitar and sang some of mine for him. He was not overly impressed, and unhesitatingly voiced the opinion that my lyrics were somewhat clichéd. Nevertheless, he offered the little bit of professional advice that he could at the time and suggested I contact his manager, Mary Martin, when I was next in New York. Six weeks after the end of the school year and two months after my nineteenth birthday, at the beginning of June 1967, with a few dollars and a small suitcase full of ambition in hand, I took the overnight bus from Montreal to New York City. I checked in to the Village Plaza Hotel, on Washington Place, just one block from Sixth Avenue and Fourth Street in Greenwich Village, which was, of course, the geographic centre of the folk music world and exactly where I wanted to be. Mary Martin, Leonard Cohen’s manager, was a formidable Canadian businesswoman. An associate of Albert Grossman, who handled Dylan, she personally managed Ian & Sylvia, Gordon Lightfoot, the Band, and the Stormy Clovers. I called her and when I said Leonard Cohen had sent me she agreed immediately to see me. Like Cohen, she too was kind and generous. She lent me a small Uher professional tape recorder and microphone and asked me to make her a recording so she could listen to my songs at her convenience. That evening I stayed up in my room at the Village Plaza, waiting for periods of quiet, and recorded several of my compositions. The next day I dropped off the recorder with my audio tape at her office. A few days passed until I got in touch with her again. To my surprise, Martin told me she had arranged a live audition for me at Columbia Records, with an artists and repertoire executive named John Hammond. I was very excited. I remembered reading that Hammond (who was the father of the blues singer, John Hammond, Jr.) had been involved with the signing of Bob Dylan to Columbia, but at the time I failed to grasp how important he was. Later on I understood that he was one of the most influential producers in the history of American music, credited with the discovery of Billie Holliday and Count Basie and the signing to Columbia Records of Pete Seeger, Bob Dylan, Leonard Cohen, and later Bruce Springsteen. On the morning I went to see him I was nervous, but intent on doing my best in this totally unexpected situation. As I entered his office, I passed Toshi Seeger, Pete’s wife, who was just leaving. Hammond appeared to me like an American from the 1950s, wearing a plaid jacket and thin tie, and sporting a crewcut. He was very polite, but reserved. I don’t remember exactly what he said apart from asking me to play. I sang for him for about ten minutes and halfway through my performance realized that my audition was not going well. Then he politely ushered me out. And as I like to joke when I tell this story, the rest is musical history. I made the best of my time in New York, despite the disappointing audition. I hung out in the Village during the day, meeting people like Izzy Young at the Folklore Centre, and at night making the rounds of open mike stages at the folk clubs, including Gerde’s and the Gaslight, listening to other musicians and generally absorbing the atmosphere of the neighbourhood. One Sunday morning, I attended the regular open house concert hosted by Sis Cunningham, the musician and founding editor of Broadside magazine. I was welcomed and encouraged to play a few songs, which were politely, if not enthusiastically, received. As it happened, one of the people in the audience that morning was Oscar Brand, the well-known, transplanted Canadian folk musician, and he invited me to be interviewed and to perform for a half hour on his weekly public radio show, which I did before leaving New York. By late 1967 my reputation as a singer and songwriter was growing. I was invited to be a featured performer at both the Montreal Folk Workshop and the Yellow Door, and I was also starting to get gigs in other small Montreal clubs. 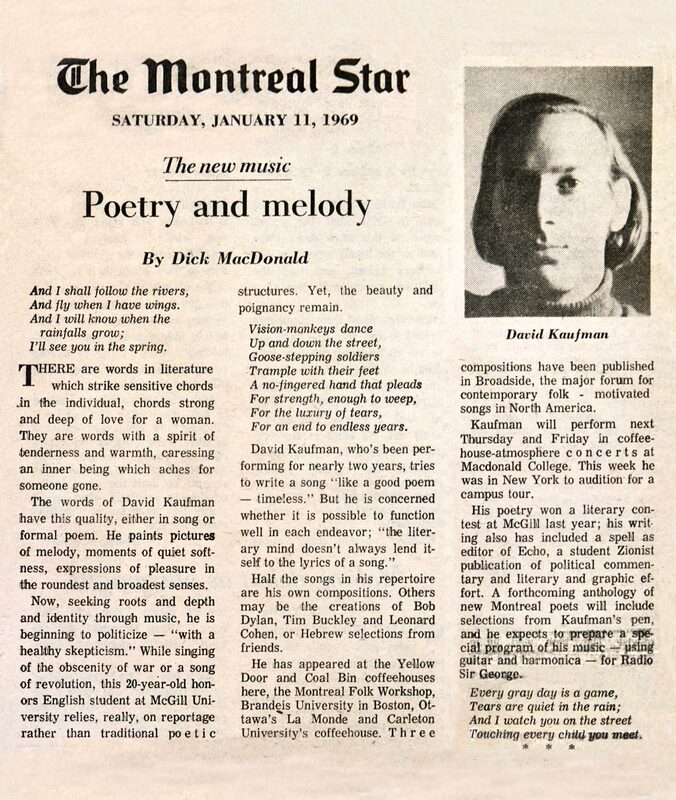 Around the same time I got together with a number of other McGill students to form a folk music group that we named Xanadu. The group’s members included a good friend of mine, Peter Shizgal, Ronney Abramson, whom I had met some years earlier, a friend of Ronney, Bev Scullion (who had the best voice in the group), and Jon Schneer, an American. Only Ronney went on to have a substantial career in music, recording a number of commercially successful albums during the 1970s for Capitol and True North records, while Peter and Jon eventually had academic careers. But for about eighteen months we had a wonderful time making music together. Three of us, Jon, Ronney and I, were songwriters, so we had a lot of original material. We also covered new songs, such as Tim Buckley’s “Pleasant Street” and Dylan’s “Just Like A Woman.” We had quite a following at McGill and were good enough to attract the attention of a local music producer, who paid for us to record two studio demos. The height of our concert experience was a two-hour show in late 1968 for a capacity audience at the McGill Student Union, on a double bill that we split with the McGarrigle sisters. Xanadu eventually broke up in 1969 when Jon went back to the United States for a while and I graduated and decided to move to New York to study filmmaking at Columbia University. Through 1968 and early 1969, aside from the work with Xanadu, I continued to pursue a solo career. For the first time I had some concert gigs, notably one produced by a friend of mine at Brock University in St. Catharines, Ontario. I shared a double bill with David Rae, a skilled guitarist who was emerging from his role as a sought-after accompanist for people like Gordon Lightfoot and Ian & Sylvia and becoming a headliner in his own right. I also knew Jesse Winchester, who lived down the street from me, near Mount Royal and Park Avenue, and we were both hired on one occasion to play a concert at a large Montreal high school. 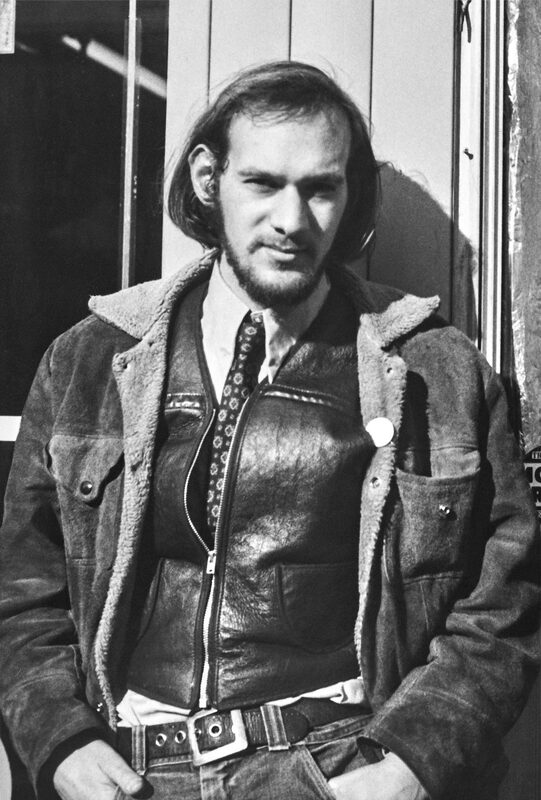 I moved to New York in August 1969 to take up graduate film studies at Columbia University’s School of the Arts. I played in New York infrequently. However, in 1970 I met a novice record producer named Steve Green, who was starting a record company called South Grape Street Music, and he put up the money for me to make a new demo recording session in a good studio. I had run into Kate McGarrigle and Roma Baran, who were then living and playing as a duo in the city, and Steve hired them to play piano and guitar for my session. Nothing ever came of the demo, but I kept the recording. Around the same time I also met a Polish Jewish musician and composer, Natan Walden, who had been forced to leave Poland in 1968 and had emigrated to New York. We hit it off and wrote several songs together. I stayed in New York until the fall of 1971. 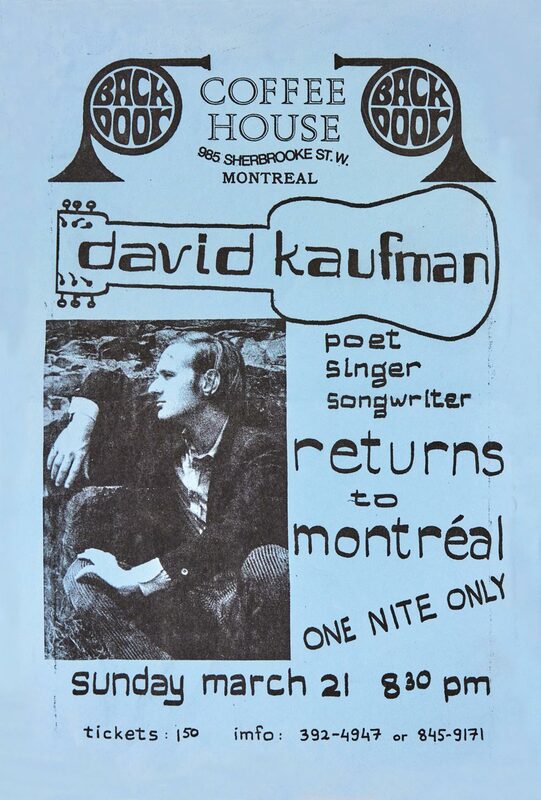 While living in New York I was invited back to Montreal only once to perform, in March of that year, when some friends arranged a one-night concert appearance for me at a new coffeehouse near the McGill campus, The Back Door. Four months later, in the late summer, I was approached by a prominent left-wing Israeli writer, Muki Tsur, who was working with the Israeli government on outreach to college campuses. He asked me to be the North American participant in a thirty-campus tour alongside an Israeli singing group, Garlic and Onion, comprised of four kibbutzniks, two men and two women. We went on the road for about two months, starting in mid-September, and travelled the continent from New York to Berkeley and Vancouver to Montreal.